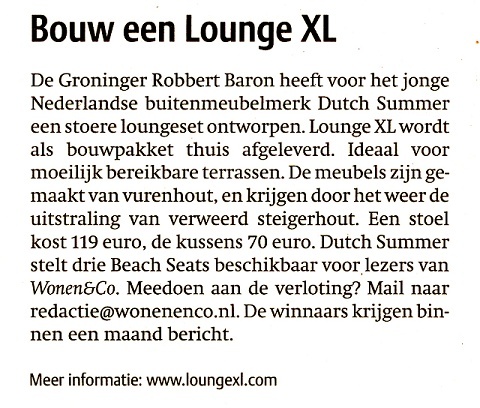 The Groningen Robbert Baron for the young Dutch Dutch Summer outdoor furniture brand a tough lounge set designed. Lounge XL as a kit delivered to your home. Ideal for small terraces. The furniture is made of pine, and the weather get the look of weathered wood scaffolding. A chair costs 119 euro, 70 euro pillows. Dutch Summer proposes three reck Seats are available for readers of Housing & Co . Participate in the raffle? Mail to redactie@wonenenco.nl. The winners receive within one month notice.